But, if money IS an object, then you need to make trade-offs, balancing the performance you need with the money you have. The good news is that you don’t need to buy the top-of-the-line to get a system today that can meet your editing needs for the next several years. When Apple rebuilt Final Cut to create FCP X, they focused on upgrading its underlying architecture to take advantage of coming advances in hardware. This includes an all-64-bit architecture, optimization for core technologies including Metal, tight integration with both CPU and GPU, and the ability to take advantage of faster i/o – both to the processors and storage. There are no optimizations in Final Cut, Motion or Compressor that focus specifically on the iMac Pro. Instead, Apple’s media apps take advantage of whatever technology or performance benefits are provided in the hardware. In other words, there are no new features in FCP X that appear if it is running on an iMac Pro. What does appear is faster performance. In other words, these numbers are based on the high-end 18-core system, which won’t be shipping until next year and, as you’ll see, may be more than you need. DO YOU REALLY NEED AN IMAC PRO? Well, “need” is a relative term. If you principally work with SD or HD material, an iMac will be perfectly fine. The performance benefits of the iMac Pro don’t justify the expense. If you are hobbyist, no, you don’t need an iMac Pro. This is not the same as not wanting one, but you don’t need it. 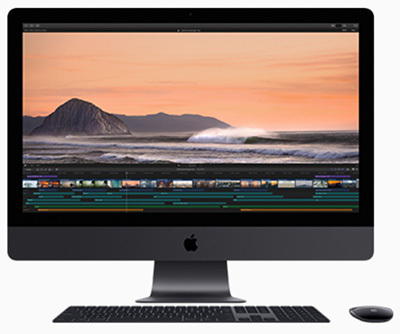 However, if the bulk of your work involves 4K or greater frame sizes, 360° VR, RAW files, or HDR, the performance benefits of this new system make it worth considering, because the design of the iMac Pro significantly speeds working with larger frame sizes, faster frame rates, more effects, more processor-intensive codecs (such as HEVC). With that being said, let’s take a look at the specific components to see which ones make the most sense for video editing. It can drive two other 5K displays or up to four other 4K displays. It has enhanced external connectivity and more Thunderbolt 3 ports (so you still have Thunderbolt ports left over for other accessories after connecting a display). Before the shouting starts, let me say again that if money is no object, buy the top-of-the-line iMac Pro. However, for most of the editing that most of us are doing, we don’t need to buy the top-of-the-line system to get significantly improved editing performance. The 8-core system is fine for most editing and compression. For example, H.264 compression takes advantage of a hardware encoder which is built into all current Macs. This hardware encoder is independent of CPU cores. However, there are benefits to more cores, especially when decoding and encoding heavily threaded codecs like ProRes or HEVC. Also, the 10-core system offers a higher Turbo Boost speed of 4.5GHz versus 4.2GHz for the 8-core CPU. This additional speed benefits rendering and exporting. The 14 and 18 core systems are designed for other applications than video editing. I would invest my money elsewhere in the system because video editors will see greater benefits in upgrading RAM and GPU when using Final Cut Pro on an iMac Pro. An exception to staying within a 10-core system is that editors using RED RAW media or working with multiple streams of ProRes — for example, multicam work — will see improved performance with higher-core systems. Larry’s recommendation: 8 cores for general editing. 10 cores for multicam editing and RAW video workflows. One of the issues I’ve heard about the current Mac Pro is that it has a problem with heat under heavy load. What I discovered is that, even more than the Mac Pro, the iMac Pro internals are designed specifically to dissipate heat under heavy load. 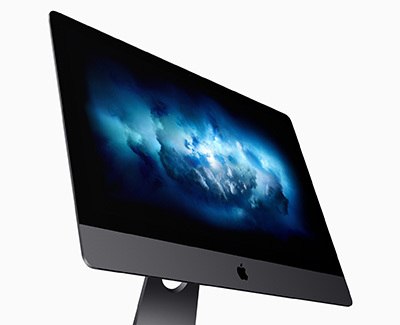 Outside, the iMac Pro is millimeter for millimeter the same size and shape as a standard 27-inch iMac with Retina 5K display; outside of the space gray color and a few extra vents on the back. But, on the inside, it’s radically different. One of the key things Apple was able to do is make the system all flash-based; 3 GB/s of fast SSD is pretty darn fast! Switching to all flash allowed Apple to remove the 3.5” hard drive and use that large space for a dual blower design and a massive heatsink and heat pipe architecture. This delivers 75% more airflow and 80% more thermal capacity, enabling far more CPU and GPU power in the box over a traditional iMac. It is also worth noting that it does all this while still being super quiet (it is an iMac, after all), letting you focus on your work. In general, editing video tends to use more of the CPU while effects and graphics tend to rely more heavily on the GPU. Increasingly, both FCP X and Premiere rely on the GPU for more and more tasks. Also, the greater the VRAM, the better the GPU performance. Whether you use Motion, After Effects, Premiere or Final Cut, investing in the best GPU will be a wise choice. NOTE: While VRAM is important, VRAM is not the only determinant of a superior graphics card. For example, the Vega 64 is significantly faster in addition to the larger amount of VRAM. Also, more VRAM offers benefits when working with large frame sizes, multiple video streams (i.e. multicam), multiple displays, and complex motion graphics. Larry’s recommendation: Upgrade to the Vega 64 graphics card or better. UPDATE: It important to note that buying a better GPU does not improve image quality. What it does, instead, is work faster. Specifically, faster rendering and exporting. If time is scarce, an updated GPU will speed effects rendering, exporting and, in some cases, video compression. The 32 GB default RAM is fine for virtually all editing. If, on the other hand, you run multiple applications at once – say FCP X, Motion, Compressor, Photoshop and a web browser – 64 GB of RAM is better. While there is value in more RAM beyond 64 GB, you won’t get enough bang for your buck to justify the additional cost. Larry’s recommendation: 32 GB for people on budgets, with a maximum of 64 GB for serious multi-application users. UPDATE: The latest updates allow expanding RAM to 256 GB. Cool. But all you really need is 32 – 64 GB. The iMac Pro ships with a 1 TB SSD. I have’t measured it, but it is probably way past blindingly fast. (Apple says 3 GB/second!) The problem is that most media projects today far exceed 1 TB in storage. You will need an external high-speed, Thunderbolt 3 RAID system for even medium-sized projects. Larry’s recommendation: Stay with the 1 TB SSD. Spend your money on faster, bigger external storage. Unlike video editing, video compression has its own requirements for system resources. While this is worth its own article here are some thoughts. Both H.264 and HEVC are relatively highly compressed formats. This compression, of course, leads to smaller file sizes, but the resulting compression requires more processing power. With H.264 and HEVC, decoding and most encoding actions are processed via dedicated H.264 hardware within the system. NOTE: A select set of custom H.264 encodes in Compressor may use the H.264 software encoder, which is threaded across multiple cores. So while ProRes encoding benefits from faster, higher-core CPUs, H.264 and HEVC are not similarly CPU bound. Also, it’s important to note that video compression often includes other operations including retiming, scaling, and color conversion — all of which use the GPU. If you are interested in HDR, 8-bit HEVC does, in fact, support HDR. Still, 10-bit encoding is recommended for the highest quality HDR output when using the HEVC codec. The reason this is important is that current Macs only support hardware acceleration of 8-bit HEVC. This makes the iMac Pro about 3x faster in HEVC encoding than an iMac. For 10-bit encoding, the HEVC software codec is threaded and can therefore take advantage of multiple CPU cores when encoding; more cores means faster video encoding. WAIT, WHAT ABOUT THE MAC PRO? 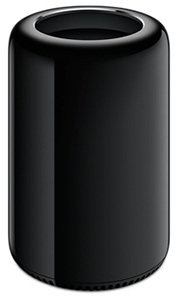 First, Apple has announced and reiterated that they are working on a new, modular Mac Pro. However, they haven’t announced specs nor a release date. The current Mac Pro is getting long in the tooth. In terms of performance, the iMac Pro is a better choice. For me, while these benefits are not trivial, the hardware inside the system has not be upgraded in several years. If you are focused on video editing, the existing Mac Pro is not the best current choice. So I recently purchased the iMac Pro 2.3GHz 18-Core w/ 128GB RAM, 2TB SSD & Radeon Pro Vega 64. I have this connected to a QNAP external drive via thunderbolt 3. It has 4x Seagate 8TB IronWolf NAS SATA 6Gb/s NCQ 256MB Cache drives. I am mainly editing 4K files and when I first got the machine it was rendering a 15 minute clip in 3-4 minutes but now its taking almost 20 minutes to render the same project. One thing thats been occurring w/ this imac is that it will turn off (completely shut down) after about an hour of idle. Even though my settings are so it never goes to sleep or turns off, it still does it. I don’t know if its a power supply issue but Apple has already sent me a new power cable which didn’t change anything. I’m curious if the shut down issue could also be connected to the render time increase? I’ve tried using a G-Raid thunderbolt 3 external drive to edit the same project and the render time is about the same, maybe a little slower w/ the G-Raid. So I don’t think its a hard drive issue. Thanks for the help Larry! There’s a bigger problem with your computer – this is not your software acting up. Get back in touch with Apple Support – there’s a problem in the OS or with the hardware. Same things happens to my iMac 27″ late 2014. After a while it just turns off during rendering/compressing .h264. It seems to have something to do if I have Safari open or not. I always restart and only run FCPX when starting an export. There’s no reason for an iMac to shut down during normal operations, regardless of which apps are open or running. This is something you need to contact Apple Support about. Larry is correct, however, this is a wide-spread problem for which Apple has yet to address in full. My iMac Pro 18-core, 128 RAM, Vega 64, etc. was jittery the graphics at login (e.g. like watching a 60fps+ video at 5fps), and then began completely blacking out (as though power was cut) during video transcodes, opening project files, rendering animations, and on to what seemed to be a melt down over a short time. Apple attempted to repair what they thought was the problem (replaced logic board, screen?, fans, and other components), but to no avail. So, they have since replaced the machine with a brand new one. No flickering at login. Had one crash while trying to scrub the timeline in Premiere Pro. I have read about this on several sites (x100), and these kernel panics crashing the machines. Catalyst(s) ranging from Vega 64 getting throttled, T2 chip, or a design flaw. This all transpired over the last month and a half. Just got the new iMac Pro. Hope this is resourceful. I’ve had none of these issues on my Mac Pro at home, which makes me pretty sure it’s not the apps or OS. Is the 10 core and 64 ram really enough for 4K premiere or should I get 128 ram? I run photoshop and Lightroom at the same time. Would the higher Ram help make it so no proxies have to be used, any benefit to that or the 14 core? Editing 4K video really isn’t CPU dependent. More often, bottlenecks are caused by storage which isn’t fast enough to keep up. Proxies are most often storage dependent, not CPU dependent. Yes, a 10-core CPU is more than fast enough to edit 4K video. And you won’t need more than 64 GB of RAM, personally, I recommend you install 32 GB. Slight diversion but I’m planning on getting a 2018 Macbook Pro 15″ and debating between 16Gb vs 32Gb Ram. Is the extra Ram really necessary for up to 5minute 4K editing? Do more effects take up Ram or more GPU? I’m intending to switch from Premiere to FCPX too. I’m hoping the 6 cores, SSD and GPU upgrades will outweigh the need for extra RAM, as I don’t do more than Lightroom, Photoshop and Premiere (Soon to be FCPX) at the same time. Given the rest of the specs of this system, 16 GB of RAM should be fine. You have a VERY fast GPU and EXTREMELY fast SSD. Those will help keep your system peppy. Recently I’ve been editing 6k r3d/red files, for (very independent) tv/film productions with premiere. So timelines could be from 1-2hours. (on my system now I have to edit with 1/4 res for smooth timeline playback and exports are brutal.) I don’t do anything else in post besides the edit, but I am interested in training myself to color grade with Davinci. I was wondering if you think the 10-core, 64gb memory, and Vega 64 graphics would be powerful enough for my work? I would expect that iMac Pro system to be plenty powerful for your work. Keep in mind that you’ll also need fast external storage. I want to to buy a iMac Pro now. Mostly for editing HD with Avid and After Effects. Would you still recommend to buy it right now or is it worth to wait for an update? The iMac Pro is available today. That’s a big plus. Apple has announced a new Mac Pro, coming “later in 2019”. But we don’t know what or when. That’s a minus. Would I recommend it? Probably yes, though I would check with Avid to make sure they like it – Avid is VERY particular about specs. This article talks about the trade offs you need to make. I recommend the 10-core, not more than 32 gig of RAM. Then, talk with Avid about what they recommend for GPUs. We’ll wait until the 2019 Developer’s Conference before making my decision. With the cost of Apple hardware these days, I’m going to have to live with my decisions for a while. Larry, do you recommend buying a small amount of memory from Apple and then getting the new system and installing very good third party memory as a way to bring the cost down? Upgrading the RAM on the iMac Pro is much more difficult than previous iMacs. You need to remove the entire screen from the case (requires striping the glue and re gluing afterwards) and remove the boards so its not for the faint of heart! Thanks for the update. I couldn’t remember, so I’m glad to have your comments. I want to upgrade my workstation (iMac 2011) and edit on FCPX (which is why I stay on Apple system). I work on long formats with lots of rushes (documentary editing), and I sometimes do multi-cameras editing, which I still can do on my machine with proxies. Over the next few years it is not impossible that I sometimes work on heavier files, 4K or RAW: I just followed a 1 month training on DaVinci Resolve and I would also like to develop an activity in the color grading area. Generally I can take the time to convert my rushes to optimized media or proxies. 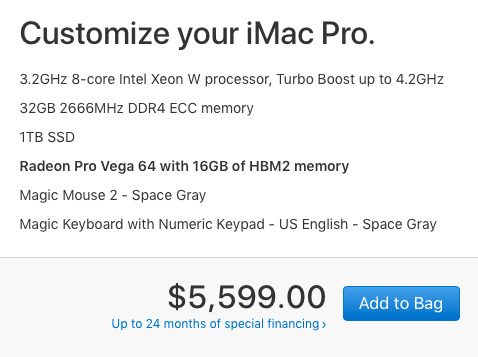 Here I am : I have the budget for a basic 2019 5K iMac: i5 hexacores, with 256GB SSD instead of the Fusion Drive, Radeon Pro 470 and 16GB RAM. “What do you think?” Smile… I think you are worrying too much. Any 2019 iMac you get today will be multiple TIMES faster than your 2011 system. * Longevity. Look how long your system lasted. I’m using a 2014, 2016 and 2017 iMac with zero problems. Any system you get should last years. * Heat management. Yes, I’ve read about this, too. However, it has never caused problems in real-world editing. * eGPU. I don’t advise them for iMacs. eGPUs are designed to boost the power of laptops. 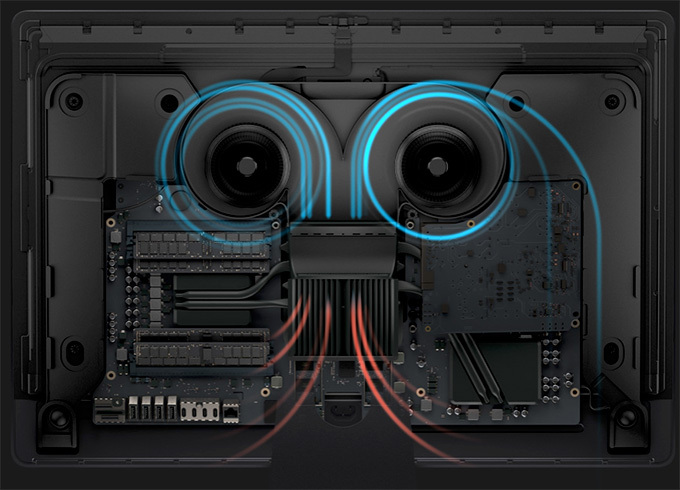 Most eGPUs simply equal what ships standard with a mid-range iMac. * CPU. Truthfully, for what you are doing, spending more to get the i9 will be worth it, especially for video compression. However, if you don’t have the money, the i5 won’t let you down. * I recommend the Fusion drive over the SSD. VERY similar speeds to an SSD for frequently used applications and media, with much greater storage. Yes, the SSD is “faster,” but the Fusion drive is very competitive, for less money and greater storage. * The graphics requirements of the display are factored into the GPU. Again, your choice of GPU is light-years ahead of your 2011 system. Multicam editing emphasizes the CPU. Editing 4K also uses the CPU. GPU is used in color grading, effects rendering and export.